Day-ahead power went up 2.6% to average £64.0/MWh in December. However, the contract fell to a fresh four-month low of £56.5/MWh on 6 December, as wind generation was forecast to rise the following day. The month-ahead (January) power contract gained 0.4% to average £66.1/MWh. All seasonal baseload power contracts rose in December, up 3.1% on average. Summer 19 power gained 3.1% to average £57.7/MWh, rising to a 10-week high of £59.9/MWh on 19 December. The annual April 19 power contract increased by 23.0% to average £60.5/MWh. 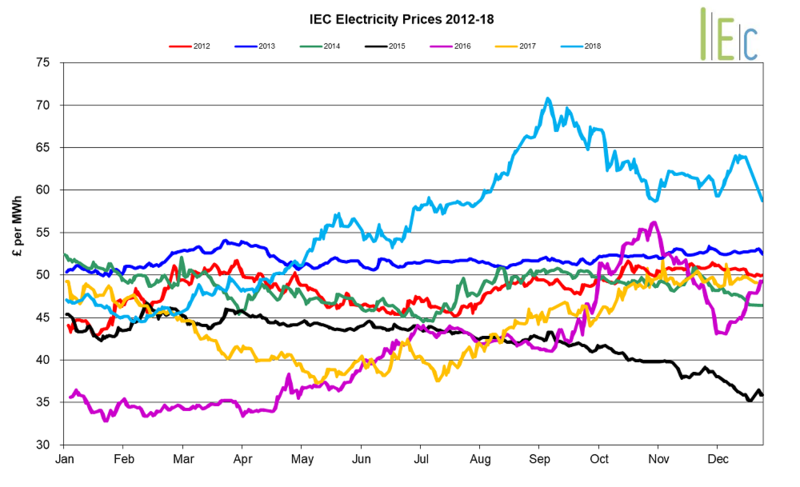 Day-ahead power prices rose as EU ETS carbon prices recovered from the previous months decline, with weaker wind generation also supporting day-ahead power prices. Wind accounted for 17.5% of total generation in December, compared to 18.8% in November. Seasonal power contracts were supported by soaring EU ETS carbon prices, which climbed 18.4% to average €22.6/t in December. Average daily demand increased month-on-month, rising from 0.821TWh/d in November to 0.823TWh/d in December. Average peak demand fell month-on-month, down from 43.3GW in November to 42.9GW. All tracked gas markets decreased in December. The largest decline was observed in GB and Belgian Zeebrugge prices, both of which dropped 8.1p/th to 58.3p/th and 59.1p/th respectively. 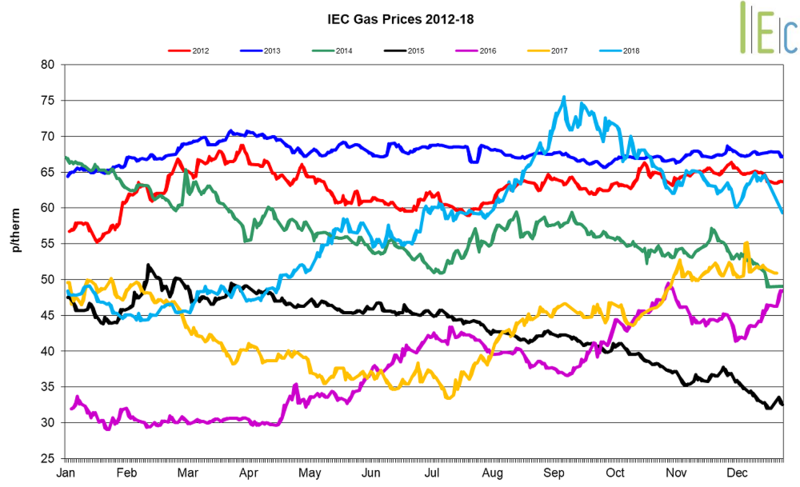 European gas prices fell amid high LNG send-out across NW Europe. A total of 26 LNG cargoes arrived at Belgian, British and Dutch ports in December, with three arriving in Belgium, 16 in GB and seven in the Netherlands. This has coincided with record LNG regasification rates for continental Europe, at 14.5Bcm between 1 October and 26 December 2018. Regasification levels at the Dutch Gate LNG terminal were at 1.82Bcm during the same period, up by over 3,300% year on year. Milder temperatures were also responsible for pressuring prices in December, with temperatures across Northwest Europe well above seasonal normal levels throughout most of the month, up to 4oc higher at times. This led to a fall in heating demand across the region, a trend which was expected to continue into January as forecasts expected much of the region to remain mild early in the month. French power prices fell towards the end of December as temperatures turned milder, weak demand and high levels of output from nuclear power plants enabled exports to neighbouring countries. This has been despite ongoing strikes at French power plants, including the Cordemais (1.2GW) coal-fired power plant, with the country’s other coal-fired power plants also offline throughout December. German power prices dropped £6.8/MWh to £47.4/MWh in December. Despite forecasts of colder weather throughout the month, water level forecasts for the River Rhine predicted water levels would return to normal early in December, allowing coal to be delivered to power plants and easing supply concerns. Data released from Germany’s AG Energiebilanzen (AGEB) energy industry group, reported that Germany primary energy consumption was expected to fall to the lowest since the early 1970s, as data showed a 5% decline year-on-year. A German utility lobby group, BDEW, also reported that preliminary data for 2018 showed coal and renewables were on par for power generation, both accounting for 35% of the generation mix. Brent crude oil prices fell 12.2% to average $58.7/bl in December. Prices were pressured by fears of an oversupplied market, leading within-day prices to drop below $52.9/bl on 21 December, a 13-month low. This was despite production cuts from OPEC that are planned to reduce global supply by 1.6mn bpd in 2019, as the US Energy Information Agency expects growing US shale production to offset the impacts. API 2 coal prices went up 0.4% to average $87.5/t in December. Coal rose to a five-week high of $89.8/t on 17 December but ended the month lower at $85.8/t as China banned seaborne coal imports from November. Cooling Chinese demand has led the Australian government to issue a report forecasting that coal prices in the region could decline by 30% by 2020 from 2018 average levels. The report also forecasts a global decline in coal demand in 2019, down 1.5% from 2018 levels to 1.08bn tonnes. EU ETS carbon rose 18.4% to average €22.6/t in December. Carbon prices started the month at €20.7/t and went as high as €25.5/t on 24 December. The lack of EUA auctions over Christmas, combined with the start of the Market Stability Reserve (MSR) in January 2019, supported EU ETS carbon prices across the month. EU ETS carbon rose 208% from 1 January 2018, and while this suggests a remarkable rise, there was still volatility in the market, particularly from September. Rises and volatility were attributed to the imminent start of the MSR, the cancellation and postponement of German and GB auctions, uncertainty surrounding Brexit impacts, and periods of high coal-fired output across Europe.